During the month of March Exclusive Books and Map Studio will be giving you R40 off your purchase of Globetrotter Travel Packs! Now is the perfect time to start planning your holidays, before the upcoming public and school holidays push the travel prices sky high. What better time to stock up on one of the best brands of travel guide available? 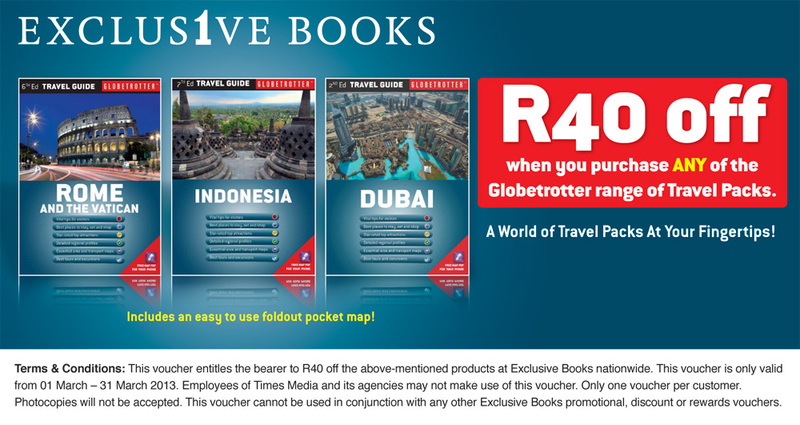 All you have to do is collect and present your voucher at any Exclusive Books store along with your purchase of a Globetrotter Travel Pack, and you will automatically receive R40 off your total purchase! The image above shows you what to look out for when seeking your Globetrotter voucher. Please note that this offer is valid in stores only, not online. The highly successful Globetrotter Travel series, which includes guides, maps and atlases, presently covers more than 80 destinations worldwide. The packs are excellent value, including both a guidebook and a soft cover of the foldout Globetrotter map of the region, in a printed plastic wallet. Practical, informative and user-friendly, the Globetrotter Travel Pack to Mauritius highlights the major places of interest, describing their principal attractions and offering sound suggestions on where to tour, stay, eat, shop and relax. Make sure to read all the terms and conditions of use on the voucher before making your purchase. And happy travels!